Sharing with you all experience of Sai sister Archana ji. I don’t have words to describe what kind of service you are doing. I am sure you get to hear this 1000 times a day may be even more than that. But trust me when I say that you and your blog have been a savior for me in every possible sense. I wish I could ever get a chance to meet you in person and shower you with my appreciation for your work. I have an experience that I would like to share with all the readers .Don’t share all the email with readers please. Just the experience. I haven’t been an avid Sai Devotee but I guess I am a religious person. 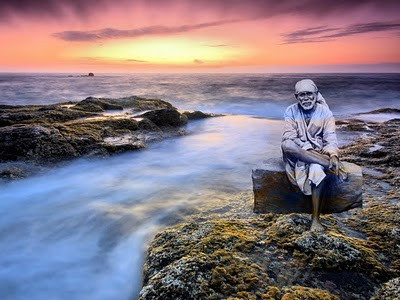 Recently for some reason I had this urge to read about Sai Baba and I started browsing about it on the net. I came across Hetalji's blog and while going though it I read about Sai Satcharita. I decided to start reading it from Thursday. Since I haven’t done anything like this before I was completely unaware about the procedure for it. But I still decided to go ahead and do it anyway. The only thing that I decided to follow was that I shouldn’t speak bad about anyone, lie to anyone or fight with anyone and try to think about Sai as much as possible. Since I wasn’t planning to read anything I wasn’t prepared for the puja and I didn’t have the SAI SATCHARITA either. So every day for 7 days I would read SAI SATCHARITA Online. On the 6th day I had a big lousy fight with my husband and ended up saying a lot of things I shouldn’t have said. I felt very bad later on because I was reading SATCHARITA to have some peace of mind. Invariably because of the fight with my husband I had lost my peace of mind and it disturbed my puja as well. As soon as I went to bed that night I kept on saying sorry to Sai Baba and to forgive me for what I had done and said that day. The next day i.e. on Thursday I decided to go to the Temple. While I was leaving I told my husband I have never done anything so religiously in my entire life but because of him I fought and it ruined my puja and that I pray that Sai Baba forgives me and gives me a sign that He is happy with my puja . Saying so I left for the temple. I was reading the Satcharita during Navratri and when I went to the temple I saw the decorations and all and I thought to myself I wish I had done all this at my place and had a nice Satsang and all on the last day. But I didn’t expect in my wildest dreams what was to come next. As it was Thursday the temple is crowded with devotees who come for Sai baba puja but that day because of Navratri every one was busy with Devi Maa Puja and when the Sai Baba Aarti started there was hardly any crowd, I guess around 10 or 15 people that’s all. When the aarti started the Priest was there but he was busy with other puja that was going on in the temple so he handed over the Aarti Plate to a lady and told her to go ahead and do the aarti. While she was doing it half way through she looked back and saw me standing behind her and she handed over the aarti plate to me and asked me to do the rest of the aarti. I was so overjoyed I was like this is exactly what I wanted to do at my house and now I get to do it in the temple with so many people. I finished the aarti and after the Prasad distribution I left the temple all happy and cheerful. When I told my husband what happened he said that now I know that Sai Baba isn’t upset because I fought with him and said all bad things and all. Though I was satisfied I told him that I am happy but I couldn’t do the satsang as I wanted so, that wish still remains and all. That day ended and we went to bed. The next morning I was yet to get over my euphoria of the other day when I got a call from my husband. He said that may be Sai Baba is listening to you after all. I asked him why he thinks so and he told me that one of his office colleague is having a Sai Baba satsang at his place that day in the evening and he has invited us. I was so happy I was like this has to be a joke. Everything that I wanted to do while reading the Sai Satcharita came true one by one. I learnt one thing from the whole experience that when you do something with all your heart and mind HE will listen to you. It doesn’t matter if you do a puja 24 hrs a day, even a heartfelt NAMASKAR is enough for Him to listen to you.